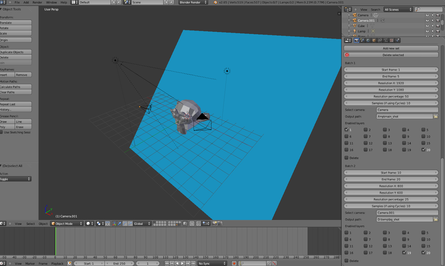 Sssampo on #blenderaid on Freenode recently asked why Blender doesn't have a batch rendering tool like 3ds Max does. After giving him a few lines of Python that achieved this task I wondered the question myself: Why such an obvious tool doesn't exist? It's a bad idea to delete from a list while iterating it You can't copy objects that are stored in bpy.context.scene easily (not even copy.deepcopy works) So I made a few nasty hacks that "work" well enough. I hope those don't come back haunting at me some time in future. I probably will add a few more things in script if people ask for them, but as far as I understand the script works already and makes the workflow easier. You no longer have to put 4000 frames rendering for half a day, then come visit your computer every hour to see if you can start rendering the next batch of frames.